So, basically, it is currently far too easy for you to ignore any sort of threat, with the exception of caves that happen to spawn lots of monsters before you can light them. I for one am more interested in the survival and exploration aspect of the game, and it is off-putting that monsters don't try to kill me once I'm in my house or in a well light area, with no threat of them ever getting to me. I expect most of the outrage comes from people that haven't thought about the new changes much. Godmode isn't fun, and the implementation of limited torches is not a needless annoyance, as you can still see where you placed the torches before and simply relight them. This way, you won't get lost in deep cave, but you may have more difficulty progressing and making your way out of one. Since the torches are still there once they burn out, you can still see where you've explored. There are also signs in the game people. Use them.. If you're more interested in the survival and exploration of the game then why complain? You'll constantly be entering new areas that are devoid of light and open you up to danger. Having monsters in your house is silly IMO, I enjoy having a safe haven away. The world is massive, cave systems are extensive.. there is PLENTY of threatening, dark world out there so I don't in anyway understand you calling torches godmode? thats just ridiculous. Part of the charm of this game that I enjoy is the contrast between your safe shelter and everywhere else in the world. When night is coming, you feel relief when you get back to your safe haven. Eliminate that and you eliminate to point of building and expanding. I've built complex structures and walkways and walls etc. All in an attempt to feel safe and secure and have a place to enjoy the fruits of my efforts mining and exploring the vastly bigger world of darkness and monsters. None of your objections make any sense or remove in anyway the things you claim to like. But the opposite completely changes the game for those who play it like I do. ACTUALLY, I hope we'll be able to carry to torches around while they are lit. I welcome the addition of more difficulty - and in this case, if you aren't totally satisfied with the change, make torches from now till the end of the month, and you'll be set for some time to come. You can welcome the addition of more difficulty, but you're not getting it. This change is simply the addition of more tedium where it isn't required. This is a part of a larger system. Combine the new lighting with more dangerous monsters and new spawn rules related to depth, and you have a rich spectrum of choices as you dig down for valuable resources. For me I see this as a good thing. As long as all existing torches turn into lanterns lol. But for I have an idea on how lanterns could be implemented. And each tiem you do this it makes 4. But of course the iron, gold and diamond would be the same but out of their own respective materials. Stone would be about the same brightness as a torch, iron would be brighter, gold would be brighter than iron (giving a use to the shiny useless metal), and diamond would of course be super bright due to it being rare. So please tell me what you think of this idea. I'm all for lanterns if they're easy to make. But if you need stuff like iron then it's stupid. I dislike this. "Why?" I ask. Players don't really need more tedium. We can't mine for coal without light. We can't mine for iron without light. When we finally get done stumbling around in the dark and MAYBE find some coal, the torches we make are temporary? So, we can't dig for iron to make lanterns, because our light will already have gone out by then? I disapprove, Notch. But you don't care what I say, do you? I'm just one in millions of your dollars (euros). Please oh please don't change the torches! They're perfect for this game as implemented. At the -very- least, have it a toggle in options or something and a server-side option for multi when that works for survival. That way we can keep permanent torches if we so choose. It would completely change how cave exploration goes if you have to collect a bunch of other resources. It's bad enough when you run out of wood when you're deeeeeep underground, but at least it feels balanced. I can see this being an option in a more RPG-type game, but I'd really not be a fan. I could swallow torches and lanterns both being permanent, but with different light radii. I'm betting a player will create a map tool that can do it in a matter of minutes if he doesn't do it. No reason to worry about it at all :smile.gif:. The change is good, people will like it, and in a month after the change threads like this will be a joke. So all is well. I like the change, because once multiplayer is fully functional, I want survival to be hard, so my friends and I will have to work together. I typically spend most of my time in caves, and making them less safe, such as gaps in my lighting, is appealing to me for some reason. But... I think Notch should just put an option for timed torches in the menus, and everyone gets what they want. There's already difficulty settings, and I don't see how this is any different. On a side note, lanterns would be really cool if they worked with redstone circuitry. Such as they burn by default, but if you hook them up to redstone you could turn them on and off, as if they're gas lanterns and the electric current ignites them, or something like that. Yeah, going with the whole reserving judgement on good/bad until I see the recipe thing. It will either basically be adding a Tier 2 lightsource, or adding tedium (i.e. I'm still going to get them eventually, but now I have to go on a first massive expedition, relight torches several times as I got lost, turn in circles, and spend half my time lighting torches and half my time trying to find my way out, finally get out, make lanterns, and then do it all again til I have enough for what I want). Tedium = Fake Difficulty, all the other features coming out? That's real difficulty, more baddies, harder baddies, deeper depths where lights don't last as long, hell world, etc. What's off this cliff? *bump* AAaaaaah, damn you sheep! Torches will just become something you use at the beginning of the game, like the Tier 1 light source, with Lanterns being Tier 2. Before you start bitching around, maybe you should wait for their crafting recipe? Only THEN will we know how much the two items will differ! Want to secure caves on the go? USE LATERNS! If lanterns just become a replacement for torches then what is the point? They will have to cost more materials, which means more time spent working for permanent light.. which lets face it we'll do anyway because WHO WANTS TO CONSTANTLY BE RELIGHTING TORCHES? They won't be used. And yeah, you use torches to explore a cave, those torches go out.... you'll end up placing more torches just to see the ones you need to re-ignite. Nothing about this change is practical or positively adds to the Minecraft experience. It doesn't make the game more difficult because we'll just spend more time on more lanterns to use them just like torches. So more time gets spent on something that previously took less time and effort and takes that time away from doing other things like enjoying the new changes. It is going to be an annoyance and a pointless time sink. I could see there being 2 levels of lanterns. A second lantern could be the same recipe, except use diamond as opposed to glass, and it could somehow work as a lens creating a more powerful lantern. I agree. 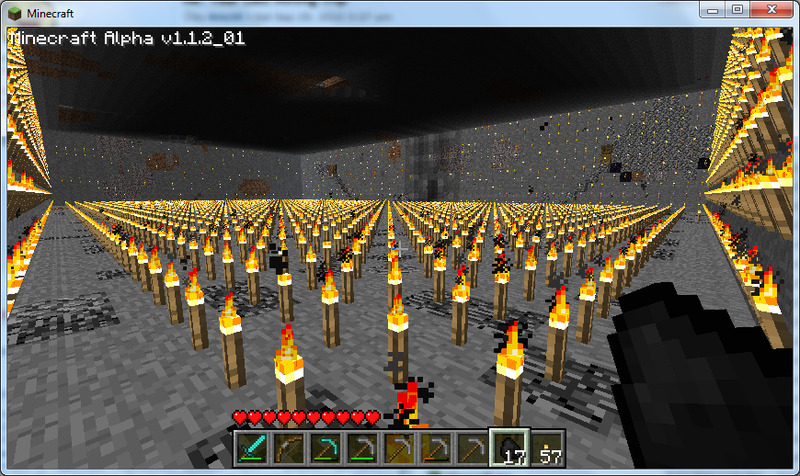 I'll just end up bypassing torches completely if possible. A New 32x Texture Pack! And the change from wood tools to stone tools, etc, takes how long? 5 seconds if you're near stone? You're comparing that to torches and lanterns? Seriously? Even going on the assumption that lanterns are made from stone and coal (or some other easily available material), the transition will take a lot longer and still be infinitely more tedious than going from wood tools to stone. And if it's not, then what's the point in having lanterns again? Looks? 1. Torches are too easy to make. Let's make lanterns use most if not all the workbench slots for no reason than to take more time with crafting. -Invalidated by further responses such as "but lanterns will be made from easily accessible materials anyway like stone or glass... no iron, we promise!! !111"
2. Torch spamming is too easy, and people doing this ruins the fun on my single player game somehow. Lanterns are little more than decor items that the player is forced to use and waste time and resources on. They essentially become just like torches, only more expensive to make, and needlessly wasting time because they will provide every single thing torches currently provide and little else beyond a change in design. Woop-de-doo-da. I have yet to see a reasonable purpose for lanterns taking over the function of torches, beyond aesthetics. It's not going to stop people from being safe in their mines and homes, and it's not going to increase your challenge or difficulty more than you have already. Want caves to be dark when you're not in them? Pick up your torches when you're done! In fact, I can guarantee that alone will be less time consuming than relighting them for the rest of us. Too bad it isn't obvious to you how some people legitimately have an issue with this. The wooden tool transition is meaningless... You use a wooden tool ONCE on your first day.. make a pick, get stone, its never again used. So that adds nothing to the game and if torches are comparable to that in your mind, it becomes equally pointless. More inventory space needs to be used, and more time put into doing something that previously took less time for no more reward. One time use because people won't bother going around (in the dark) relighting torches. Not used at all and replaced after the first or second night by lanterns which serve the exact same purpose that torches previously did (the old switcheroo) making it, again, a pointless change. My guess is lanterns will require torches to make, but if they require a lot of glass then desert biomes better be top on your list of locations. Otherwise, lanterns will have to be expensive to make and add more time to doing a necessary thing otherwise we'll spend 50% of our time running around squinting to relight torches. Won't that be a fun way to spend our time. I'm ok with it if lanterns are cheap and easy to make and look good placed all along and throughout your structures like torches were, but if they take up more space and/or look awkward then that will be vexing. hmm. i better make my own lantern farm. It won't be possible. That's the point behind a transitional object. That's the entire point for the wooden pickaxe's existance. If you don't place a torch, you're going to be punching skeletons all night. And considering this is early game equipment you are deliberately not using out of your own personal arrogance or something I don't even know why, it means you'll only have early game equipment. The only way it could be a transitional object is if you have to have a torch for the crafting of lanterns.